The last time we mentioned Nike‘s Air Flightposite model was back in 2014. Since then, we haven’t seen much of the retro model, who seemingly took the back seat of the Foamposite popularity. Nonetheless, the circa 1999 court sneaker aims for a 2018 revival with a “Legion Green” colorway that found success on the Foamposite One in 2017. 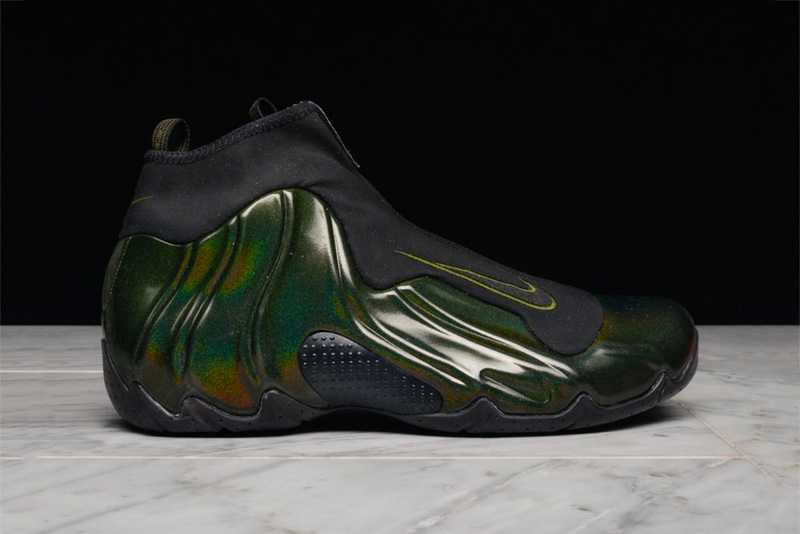 This Flightposite’s signature sculpted upper features an iridescent olive green finish that changes colors at different angles. A black neoprene ankle collar offers a slick sock-like fit, while embroidered Swooshes in green offer subtle branding. The rest of the shoe sees a black dotted midfoot shank and perforated outsole, as well as striped pull tabs and a neat tongue tab atop the zip closure. You can pick up the Nike Air Flightposite 1 “Legion Green” for $200 USD at Lapstone and Hammer. Let us know if you’re a fan of this retro model in the comments below and for more throwback sneakers, Nike’s Air Max Penny 1 returns in “White/Metallic Silver” this summer.